Make sure that the mirror is not covered by ice, snow, condensation or other objects. Convex (curved outward) or aspheric exterior mirrors increase the field of vision. They do, however, make objects appear smaller in the mirror. These mirrors are therefore only of limited use for estimating distances to the following vehicles. Whenever possible use the interior mirror for estimating the distances to the following vehicles. 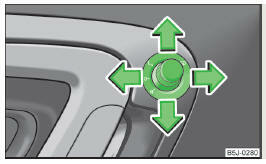 Adjust the lever at the lower edge of the mirror towards the windshield. Pull the lever on the lower edge of the mirror away from the windscreen. The knob can be moved into the following positions. The mirror can be adjusted to the desired position by moving the knob in the direction of the arrow » Fig. 53. The movement of the mirror surface follows the movement of the rotary knob. The whole exterior mirror can be manually folded towards the side windows. Restore it to its original position, it should be folded back from the side window until it audibly clicks into place. The exterior mirror heater only operates when the engine is running. Do not touch the surface of the exterior mirrors if the exterior mirror heater is switched on. If the power setting function fails at any time, the exterior mirrors can be set by hand by pressing on the edge of the mirror surface. Contact your specialist garage if there is a fault with the electrical adjustment of the exterior mirrors.